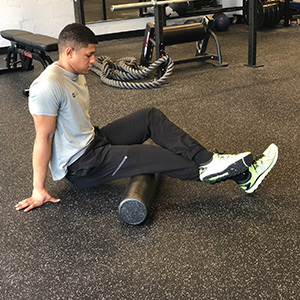 To begin foam rolling the quads, place the top of the knees on the foam roller while assuming a plank position. 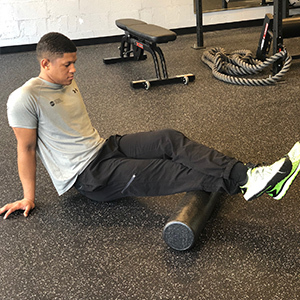 Start with both legs on the roller to gauge how much pressure you prefer. Next, slowly roll to the top of the quads applying downward pressure. If you find that you need more pressure to alleviate your quads, stack the legs for an increased effect, or lie on each leg individually. 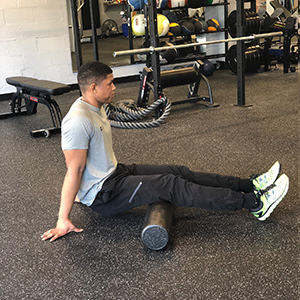 To target the gluteal muscles, sit on the roller in a vertical position. 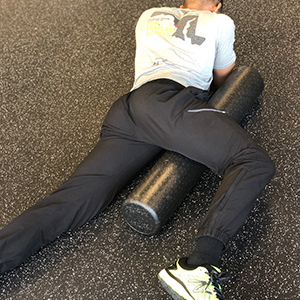 Due to the pattern of the gluteal muscle fibers, rolling side to side will be best to relax musculature. To increase pressure on the gluteals, place the ankle of the target side on the opposite knee. 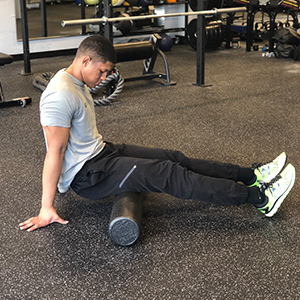 To target the hamstrings, begin sitting with the bottom of the gluteals on the roller. If more pressure is needed, stack the legs to increase the effect. To target the calf muscles, start at the top of the calves, just below the back of the knees. Slowly roll to the bottom of the calves, avoiding the Achilles tendon. For added pressure, stack the legs. 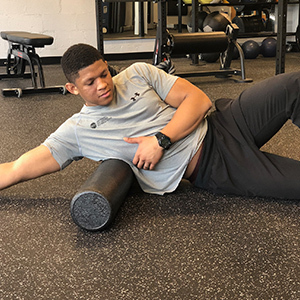 A great way to target the adductors (groin) is to place the roller under one hip while in a prone position. 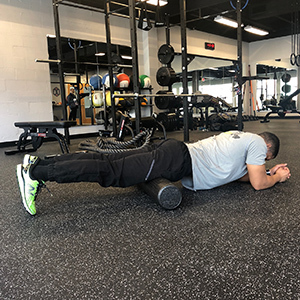 While applying downward pressure, slowly roll towards the knee to effectively target the adductors. 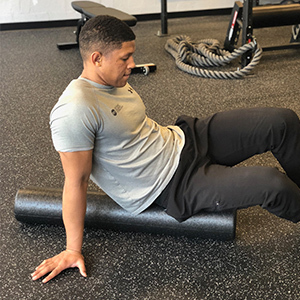 To begin rolling the back, place the foam roller at or above the bottom rib to avoid potentially injuring the lower back. 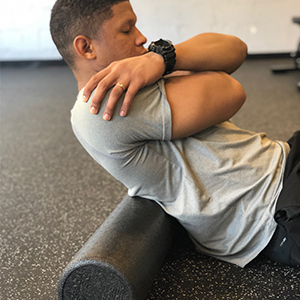 Next, slowly roll to the top of the shoulders by pressing the feet into the floor to lift the hips. 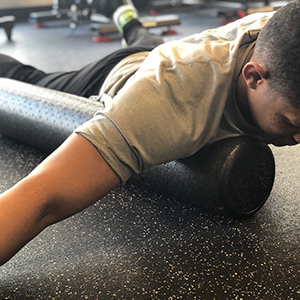 To roll the chest, begin in a prone position with the roller just inside of the shoulder. Next, slowly roll towards the center of the chest. 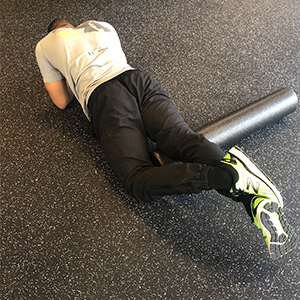 To target the lats, start in a side lying position with the roller near your middle rib. From here, slowly roll to the back of the armpit. Start with the ball under the arch. Roll along the entire length of the foot, stopping to apply pressure at any trigger points. Using any elevated surface allows your to play with different angles and pressure. Start with the ball in the center of the gastrocnemius (large calf muscle) and roll around. 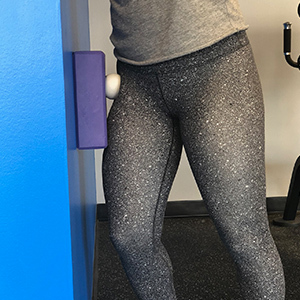 Flex and point the toes as you move down the leg to the soleus, which is often a main trigger point, as it is involved in standing and walking. 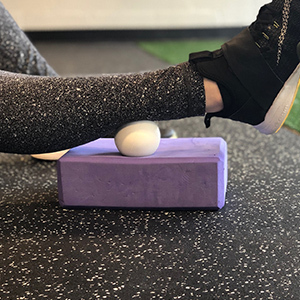 A great way to target the lateral areas of the calf muscle is to use the lacrosse ball along the anterior tibialis (shin area). Lay on your back with the ball putting pressure on your piriformis. 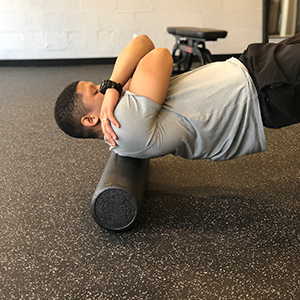 Hold or roll laterally (from the middle of the glute to the outside). The glutes and piriformis. Note the grain of the muscle fiber. Bend the knee into the chest slowly a few times. Adding movement allows you to dig deeper into a trigger point. 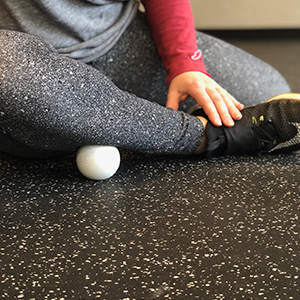 Relax onto the ball to release your tensor fascia latae (TFL). The tensor fascia latae (TFL) at the front of the hip. You can also target your TFL standing and pressing a ball into the wall. Keep pressure on the ball, but allow the leg to relax. 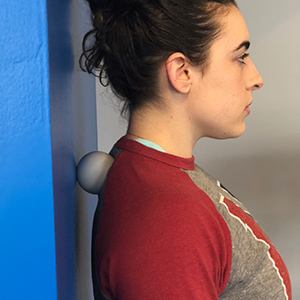 Target your pectoralis minor (chest) while standing facing the wall. Start with your arm down, and make minimal movement along the muscle grain. Raise your arm to make this slightly more intense. Use a yoga block (or an alternative) to bring the ball off the wall. You'll avoid scrunching the neck and be able to target the upper trapezius. Place the ball on your upper back, on either side of the spine. Avoid the spine, feel for trigger points and hold. Remember to breathe! Full body cryo therapy uses vaporized liquid nitrogen to give your body a 3 minute "ice bath." Check out Capital Cryo services. Join us for 45 minutes of recovery every Sunday at 12:30 pm at Next Phase Bethesda. First class is free! Still have questions? Want to come recover at Training Ground? Contact us with your questions and concerns and we'll be in touch ASAP.